Several dozen bloggers in the health care field and beyond are today engaged in a blog rally*, simultaneously posting the item below to encourage conversation about a topic that’s often avoided but needs to be addressed in every family: How we want to die. I’ve written about this before, with regard to my mother. Please try it, using the slide above as a discussion guide. It’s not that hard to have the conversation with your loved ones once you get started. This has real consequences. 73% of Americans would prefer to die at home, but up to 50% die in hospital. More than 80% of Californians say their loved ones “know exactly” or have a “good idea” of what their wishes would be if they were in a persistent coma, but only 50% say they’ve talked to them about their preferences. Here is what we are asking you: Download The One Slide (that’s it above) and share it at any opportunity – with colleagues, family, friends. Think of the slide as currency and donate just two minutes whenever you can. 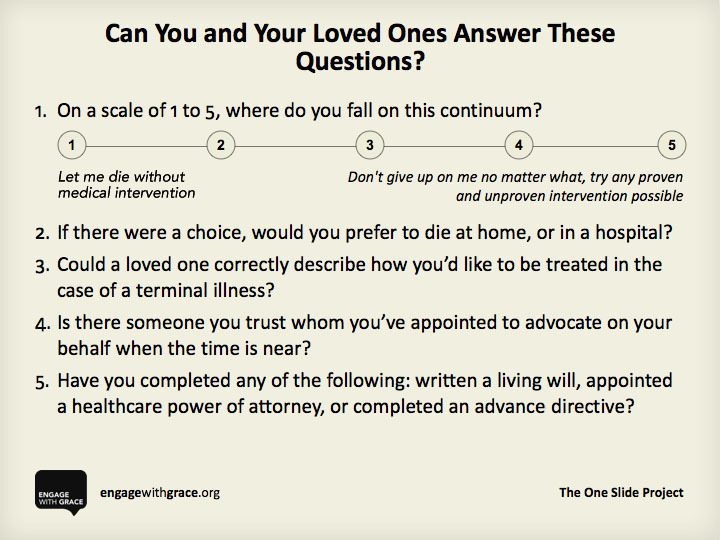 Commit to being able to answer these five questions about end of life experience for yourself, and for your loved ones. Then commit to helping others do the same. Get this conversation started. Let’s start a viral movement driven by the change we as individuals can effect…and the incredibly positive impact we could have collectively. Help ensure that all of us – and the people we care for – can end our lives in the same purposeful way we live them.